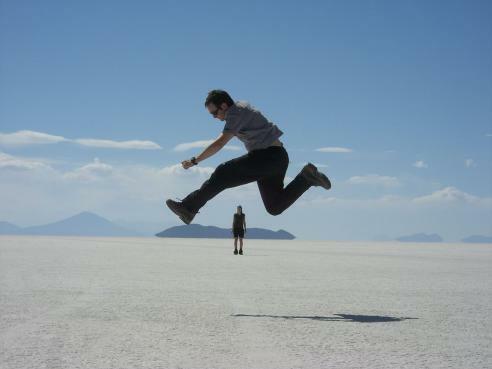 Blog from Uyuni, Bolivia | Where is the Love? The bus journey from Potosi to Uyuni was stunning. We wound our way further through the Andes on a bumpy dusty road. It felt like we were in the middle of nohere. There were mountains all around us and lots of llama walking across the road in front of us. We also saw some spectacular lightening and rain during the trip. The bus took 6 hours, the first 3 were in daylight and the last 3 in total darkness. I have no idea how the driver knew where the road was! Our bus had really screechy breaks so at least we had a warning every time we nearly went off the road! We arrived at Uyuni about 10.30pm feeling pretty tired. We decided to go out for a walk though. The town was totally quiet with not many street lights working. After about 5 mins we decided to return to this evening´s luxury hotel. This one had a shower over the toilet! Our first day was spent exploring the salt flats. We drove off from Uyuni and towards the flats. We went off road and soon hit the salt.It was like nothing any of us had ever seen before. Pure white for as far as the eye could see. The flat is about 10,000 square metres in area and originated 8000 years ago when the lake dried out. The drivers enjoyed racing each other across the salt to our first stop.It was a little village where they mine and process the salt. We were given a tour of a salt processing plant (a little hut) where the salt is brought from the flats in bricks, dried out and packed in to 1kg bags. They earned $1 for 50 1 kg bags.None of the salt is exported out of Bolivia and they can´t work in wet season (Dec, Jan, Feb) as the salt is covered in too much water. We bought a dice made out of salt from one of the local ladies. We might use it to play Yahtzee with next time we are bored. We sped on further across the salt to the salt hotel. Not surprisingly everything is made out of salt.Then our stop for lunch was at Fish Island.The island was a huge rock in the middle of the salt which was covered in cactus plants. It looked like a film set, none of it seemed real. There was a trail up to the top of the island which we hiked up in the blistering heat. The views from the top were amazing.It was pure white salt for 360 degrees with huge Andes mountains in the background. The salt looked really like ice or snow at some points and therefore it felt like it should be freezing cold, not boiling! We had a cook with us for the duration of the trip, Myrtha, who drove around with us.She prodcued some great meals (and some not so great or interesting combinations!) on a camping stove. We sat out at camping tables and stools in the middle of the salt, surrounded by our 4 x 4s and eat huge pieces of pork and salad, then bananas. After lunch we took lots of illusionary photos on the salt.There are a few on the blog so you can see what we mean. Then it was back in the cars and on to our hotel for the night. After a couple of hours of being bounced about, we had left the salt behid and were now in the dessert. We arrived at a town in the middle of know where. Again, totally dead.We drove across the football field (every town has at least 1 sometimes 2 football pitches no matter how small it is) which was being used as a grazing ground for lots of llama, to a building in the middle of a field. From the outside it just looked like a one storey breeze block building,but on the inside it was surprisingly nice. It was a salt hotel.The walls, tables, chairs, bed frames were made out of salt. The floor was loose salt and it was surprisingly warm. It cold pretty windy and cold when the sun went down out there. We wandered back in to the village and found a random little pub. It was nice but the beer was warm.They don´t seem to have many fridges in Bolivia as we have had a lot of warm drinks. After a beer we went back for dinner.Myrtha had cooked us a feast of vegetable soup, pasta and sauce and pineapple. After dinner there was a knock at the door and two little local boys came in dressed in ponchos over their tracksuit bottoms, trainers and back to front caps.They were very enterprising and explained that if everyone gave them 1 boliviano they would play us 5 songs. They wouldn´t play until everyone (about 24 people) agreed.They were very cute and funny.One had a proper guitar and one had a toy guitar but that didn´t stop him strumming away very enthusiatically! Everyone gave them their boliviano and they went away happy. The hotel was pretty comfy but this was day one of no running water, so no showers or flushing toilets. Day 2 was spent visiting many different coloured lagoons. Red, green, blue all of which had flamingo on them. The second day was not as interesting as the salt flats had been and by the end of it we were pretty sick of being bounced about and seeing lagoons. The scenery was still spectacular and we climbed higher again in altitude. We stopped to look at lots of differnt rock formations including the ¨Stone Tree¨. It was too tempting not climb up all the rocks and take lots of photos. We also saw many volcanoes, including one which was still active and had steam coming out of the top. The mountains are so high that a lot of the time the clouds are lower than the mountain top. The mountains were really different in colour too. Lots of reds and sandy colours. The terrain we drove across was incredibly varied. It could be loose gravel one minute, sand the next, really steep inclines covered in boulders, flat sand or rivers. Our heads hit the roof several times. Sometimes it was so dusty from the cars in front that it was impossible to see the road. Only once did a pair of head lights emerge head on from the dust. Stephan moved out of the way in time though! The terrain we drove across was incredibly varied. It could be loose gravel one minute, sand the next, really steep inclines covered in boulders, flat sand or rivers. Our heads hit the roof several times. Sometimes it was so dusty from the cars in front that it was impossible to see the road. Only once did a pair of head lights emerge head on from the dust. Stephan moved out of the way in time though! On the second night we again stayed in the wilderness in a lodge near the red lagoon. Myrtha cooked up a treat again and we slep in dorm style rooms. It was really blustery and cold but we were up at 5.30am the next morning so didn´t sleep much anyway. We were supposed to leave at 5am today and see sunrise but our guide wanted a lie in so we left at 6am and missed sunrise. Our first stop was at bubbling lava pools and geysers shooting steam up in to the sky. The sound of the steam was really powerful. Apparently we shouldn´t have been allowed so stand as close as we were according to a geologist in our group. She didn´t tell us until after though! She gave us a geology lesson about continent plates, magma and water. All very interesting stuff. Next we drove on to another lagoon which had a thermal spring pool at the edge. It was freezing outside but this was the only chance we had to wash for the entire trip so we jumped in. It was amazing! Like a really hot bath. After a while we had to get out as it was too hot. This was also the highest altitude we reach at 4900m. Everst base camp is about 5500m so we were pretty high up! The hotel we were supposed to stay in on the wed night was full. They offered us an alternative down the road which had no windows and needed 'cleaned' before we could stay in it. We decided against this and drove on to another remote village who had space for us an another luxurious lodging. The bedroom doors were corrugated iron, but at least it was warm. We played football with the wee boy of about 4 years old who lived there. It made his night he was smiling so much especially when he kicked it really high in the air. Myrtha cooked an interesting dinner. Chip soup for starters! Then the Bolivian dish of chips, sausage, beef and onions covered in boiled agg and olives. Not the finest cuisine of the trip. We felt a bit like this was an extra night we didn't need and that GAP had us hanging around for another night and day until the bus to La Paz. We had cornflakes for breakfast and the milk wasn't too bad. I am having serious cereal withdrawls! Then headed back towards Uyuni. We stopped at a 'train cemetary' on the way back. They will make a tourist attraction out of anything. This was a load of old steam engines that the Bolivian govt couldn't afford to fix so have just left to rust. Not the highlight of the 4 days. We got dropped off in Uyuni and said farewell to Stephan and his cruiser. we found a great Pizza restaurant then hung around for another night bus to La Paz. Only 10 hours this time!